Looking to sell scrap gold quickly? Step 1 - If you want to sell you can then give our staff a call on 01253 34308 to fix your price! Our usual buy in rates vary between 85-90% for hallmarked goods and 80-85% for un-hallmarked goods. If your looking for our buy back prices on other products please click here for our live price selling page. This process is perfect should you have very large quantities of gold or silver (such as monster boxes) or should you live too far away to justify driving. We are one of the leading UK buyers of scrap gold? We occasionally pay 90% of the intrinsic value for British hallmarked scrap gold jewellery. Many of our competitors only offer between 50-85% and some unscrupulous dealers only offer 5-10% of the true value. If you have gold that is old, broken or no longer wanted, we will buy it from you. Most of the gold jewellery that we buy is sent to be melted down, we receive a flat premium per kilo. Gold prices fluctuate, so check the live gold price to see if the price is what you are hoping to achieve. Other Alloys - Although we have listed the most common gold alloys, there are numerous other standards, and we are happy to buy all. We Buy Any Quantity - We are happy to buy any quantity of scrap, from a single piece upwards, without limit. If you have a large quantity of gold scrap to sell, we will accept your instructions on price, or offer you helpful advice on selling. We are one of the longest established and largest gold buyers in Britain. 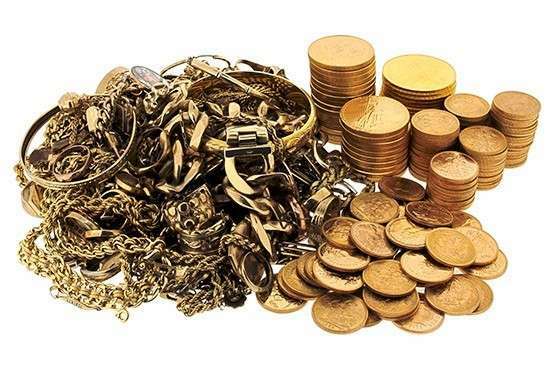 We Pay Fair and Competitive Prices - Our buying prices for gold coins, bars and scrap are fair and competitive, but depend and change based on underlying gold prices, and other market conditions such as supply and demand. Our price per gram buying prices change constantly with fluctuating gold bullion market prices. Our percentage buying prices do change occasionally, subject to other market conditions. Currently, our typical buying prices for hallmarked scrap gold work out at around 85-90% of intrinsic value. This means we pay a higher percentage than 99% of our competitors. This varies slightly depending on quantity, size, and other factors. We will buy unhallmarked gold at lower percentages to allow for testing time and cost, and the extra risk factor involved. American gold alloys are usually a half carat deficient (legally), so will be bought at an adjusted percentage. If we make an offer for your gold and you wish it returned, we make a £10 charge to cover postage, insurance, packaging, and handling. We will normally post your returned items within 24 hours. If you call in to our showroom, we will try to assess you gold while you wait, (please bring suitable ID, and we may ask for proof of ownership). We normally pay immediately by either cheque or bank transfer (BACS). Same day (CHAPS) transfers attract a £30.00 charge. We can and will pay cash, but make a 1% charge for this, except for some small transactions at our discretion. If you want cash, you should visit within normal banking hours. You may notice we do not advertise "Cash for Gold" as this may attract the wrong type of clientele! If you post gold to us, we will try to contact you to advise receipt, and also try to make you an offer the same day. You do not have to accept our offer, on the spot or at all, but the price is subject to change according to spot gold prices. Obviously, we prefer to get each deal done as quickly as possible, and move on to the next job and the next customer. Once you accept our offer, it is mutually binding; we will then process your payment by your preferred method, and adopt your scrap or other items into our stock. Although we are a small, private limited company, we have a net asset backing in excess of £1 million. Our latest audited accounts are available from Companies House. We can also pay in US Dollars or Euros. Your bank may make a charge for handling this. We may also make a small charge for this (typically 1%).